Tracking basal body temperature can be a useful tool that can help you to uncover hypothyroid and even hyperthyroid patterns, just by taking your temperature at the same time every morning for five consecutive days. 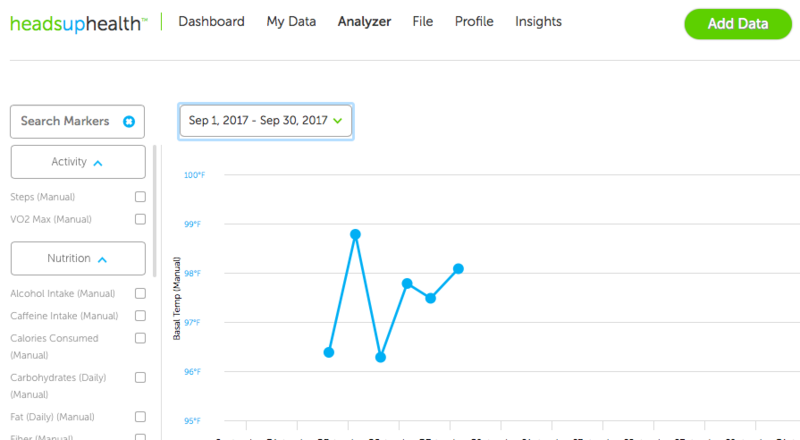 Heads Up Health makes it easy to track, trend and compare your basal body temperature readings alongside all your other health metrics. Start your free 30-day trial using the button below. 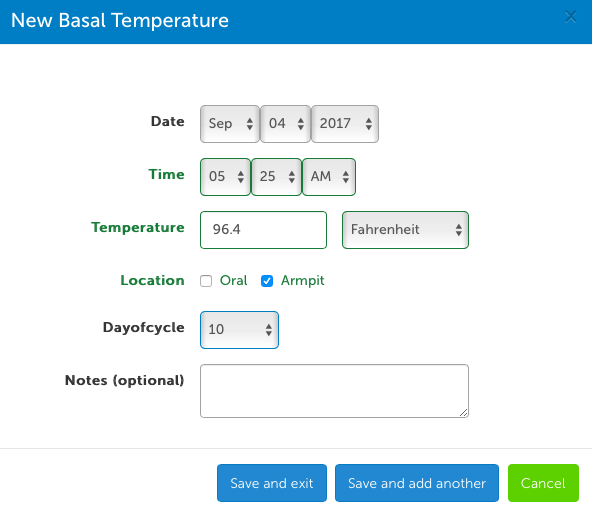 Or, read on to learn more about basal body temperature and how to track it. When tracking basal body temperature, we want to track your resting temperature which is a reflection of your metabolic activity with minimal influence from outside factors like digestion, exercise, stress, etc. After you’ve been asleep for several hours, the body has ideally settled into its resting metabolic pattern, so we have a way to compare your temperature with as little interference as possible. Most everyone knows someone with a thyroid condition. Maybe you even suspect that you have a thyroid condition, but haven’t made an appointment with your doctor yet or your labs have all come back normal. If you suspect that you may have a thyroid condition, these are some of the symptoms that you may be experiencing. low body temperature-feeling cold in a warm room, or having cold hands and feet consistently. unintended weight loss and more. Hypothyroidism is so prevalent that its become a thing we just expect to have happen to us at some point, and we often accept that these symptoms are just a consequence of getting older. Symptoms are messengers from our body, alerting us to a system that is out of balance. The thyroid influences almost every cell in the body, so when it’s not supported, the symptoms can present in other areas of our bodies. Using the basal body temperature readings developed by Dr. Barnes can help you to hone in on a potential thyroid condition and allow you to seek the help you need to support your thyroid. The basal body temperature test can be used whether or not you’ve had a thyroid test recently. Thyroid hormones are made in the thyroid, but most of the active (energy) thyroid hormone T3 is converted from the inactive (storage) T4 form in other parts of the body, which means that thyroid function is about more than just the TSH hormone levels in the blood. Other sites of conversion include the gut (20%), liver (40%) and peripheral tissues (20%). A compromise in the liver or gut can cause a decrease in the conversion of the inactive thyroid hormones to the active thyroid hormones. Another factor to consider is vitamin and mineral deficiencies as the thyroid uses iodine, selenium, zinc, magnesium, the amino acid Tyrosine, as well as vitamins A, C, D, B2, B3, B12 and healthy fats to function optimally. Because your gut health is a major site of thyroid conversion, Tracking your Bristol Stool Chart can be another piece to the puzzle when trying to figure out a thyroid pattern. Thyroid dysfunction can alter bowel movement patterns as well, which can clue us in to the possibility of a thyroid issue. The body can compensate for quite a while on reduced resources before the blood will show a significant change to be diagnosed with a thyroid disorder. Tracking your basal body temperature for 5 days can give you a better understanding of a trend for either hypo or hyper thyroid patterns, so you can further explore paces where the breakdown may be happening. 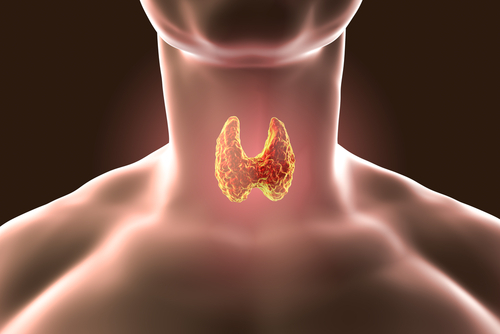 Hypothyroid is much more common than hyperthyroid, but either can occur. For more info on what labs are important to ask for when you talk to your doc, check out Amy Berger’s article on Thyroid testing here. Though she talks about it in the context of a low carb diet, the testing info will apply to anyone who thinks they may need a thyroid panel worked up. HOW to take your Basal Body Temperature for tracking. Prepare the night before you want to start tracking you basal body temperature. 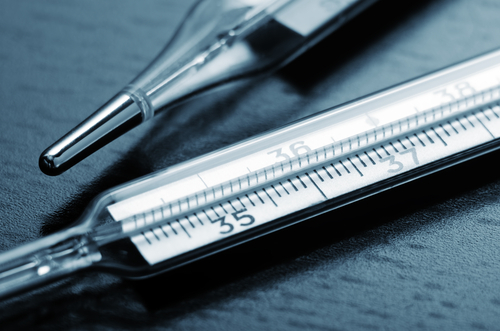 You’ll need a thermometer (glass is preferred as it’s more accurate than digital for this purpose-avoid mercury and opt for a Geratherm glass thermometer which you can find here), your phone/device for timing and documenting your results. *Note – if you sleep with a heated blanket, or multiple heavy blankets, you’ll want to remove them for the nights that you’ll be collecting your data, to get an accurate reflection of your body temp. Shake down your thermometer so that it’s ready for morning. Place all supplies by the bed where you can reach them with minimal effort in the morning. When you awaken, you will take your thermometer and place it in your armpit for minimum of 5 min (glass will need at least 4 min for accuracy), first thing in the morning. Try to move minimally so as to not rev up your body temp. After 5-10 min, record your temperature and go about your day as normal. Repeat this process for 5 consecutive days. Ladies, you will want to avoid starting or collecting data on day 19-22 of your menstrual cycle as there are fluctuations due to other hormones as well as related to ovulation, which we will talk about in a subsequent basal temperature tracking article. How to interpret your readings. Dr. Barnes found that a normal resting body temp should be between 97.8-98.2 degrees Fahrenheit. If it is consistently lower, then there is a trend toward a hypothyroid (decreased function) pattern. If consistently above 98.2, then this indicates a trend for more of a hyperthyroid (increased function) presentation. If results are mixed, both high and low, this is often more indicative of a primary adrenal stress pattern, as the adrenals and thyroid are closely linked, which would allow for the variation in body temperature. If you find that your temperatures indicate the possibility of thyroid or adrenal stress, take your readings in your Heads Up Health app to your functional health doctor/provider so you can further investigate where the breakdown could be and support for healing. Disclaimer- The content in this post is not intended to be a substitute for professional medical advice, diagnosis, or treatment. Always seek the advice of your physician or other qualified health provider with any questions you may have regarding a medical condition. Never disregard professional medical advice or delay in seeking it because of something you have read in this post.